The girls would be bleeding from their mouths or other parts of their bodies. One girl even had a pin stuck through both her lips. Some were found tied and hung up on hooks. The whole area was gripped with a heightened red alert, and everything had an ominous tone. All anyone talked about was “the poor afflicted girls,” and how evil was taking hold of them. The Puritans hated nothing more than the devil. In their minds, they were warriors for God, and they aimed to win the battle in His name. If the learned and respected ministers and magistrates thought the devil was afflicting these poor young children, it must be so. The fits would intensify each time an accused claimed innocence, and the “touch test” would be employed. The Puritans believed if a witch touched an afflicted girl, the witch’s spirit would be forced to return to her body. If the fit ceased at the touch of the accused it was taken as direct evidence of guilt. Once accused of being a witch, the best option seemed to be a confession. Some people confessed, hoping to spare their lives, while others confessed because they genuinely thought they might have done something to invite the Devil to use their form. 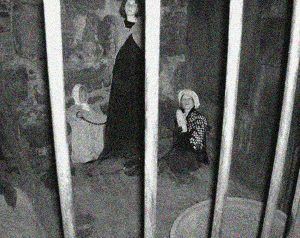 Once a witch confessed, she was expected to name her accomplices, and there was no use saying there was no accomplice. Though there was some talk of hanging the confessing witches after they were no longer needed to testify, all those who confessed escaped execution. The accused would then be taken to jail, where they would be chained and held to await trial. People were responsible to pay for their own jail costs, down to the chains used to hold them. Even after they were cleared some had to stay in jail because they couldn’t afford the jailor’s bill. A tactic commonly employed was “tying neck to heels,” a throwback from Old England. The neck and the back of the heels were tied together, forcing the body into a nauseating backward hoop. This treatment was not only reserved for charged criminals. Children of the accused witches were commonly tortured in this way to make them give damaging information about their family. A person could be kept in this way for as much as 24 hours, but, like everything else, the level of trauma inflicted depended upon the individual interrogator. The families of the accused had different reactions. Some washed their hands of their kin, believing them witches. Others, like that of Rebecca Nurse and her sisters, always stood by their family, maintaining their innocence, but, were powerless to do anything to stop the madness. Other families begged their loved ones to confess, whether they were witches, or not. Family members had to be careful because if they protested too much they could be charged as witches. When the accused were brought to trial, they didn’t stand a chance. Of the first 19 witches, every single one was found guilty and sentenced to death. One more was pressed to death because he refused to make a plea. The hangings were a public event. The accused would travel by way of a cart, with people running alongside, taunting and cursing. Then, one by one, they would climb a ladder, say their last words, and the ladder would be taken out from under them. Because there was no sharp fall to break the neck, it could take as many as ten minutes to die. After the hanging, their bodies were thrown in a shallow common grave near the site (some told stories of arms and legs sticking out of the hole). Some families, like that of Rebecca Nurse, snuck back to the gravesite during the night to remove the body and bury it in a secret place. People began to turn away from the trials when they witnessed the heartfelt last words of those being hanged; but, the real ending started when important people began to be accused. Some of these included Margaret Thatcher, who was the mother-in-law of Magistrate Jonathan Corwin, who presided over the examinations from the very first; former Governor Simon Bradstreet’s sons, Colonel Dudley Bradstreet and John Bradstreet of Andover; Sarah Noyes Hale, the wife of popular Beverly minister, John Hale; and Lady Mary Phips, the wife of the sitting governor, William Phips. On October 12, 1692, the Massachusetts General Court held a meeting to figure out what to do about the situation. They decided to forbid further imprisonment for witchcraft. On October 26th, church leaders of Massachusetts called for a statewide day of fasting, hoping God would give them the answer to the witch problem. Though the accusations were still coming in, people accused were now let out on bail, instead of thrown into the already overflowing jails. People were beginning to see the mistakes that had been made, and now, the leaders were trying to figure out how to put a stop to it. They couldn’t very well pardon all of the witches and admit to putting 20 innocent people to death, but, they couldn’t in good conscience, allow the trials to continue. The questions went on for another four months while 150 of the accused sat in jail. Finally, in May, all accused witches were discharged and could be released from prison as long as their jail costs were paid. After many petitions, in October 1710, The General Court reversed all of the convictions against those who had a family to ask. Bridget Bishop, Susannah Martin, Alice Parker, Ann Pudeator, Wilmot Redd, and Margaret Scott were not cleared because they didn’t have a family to petition on their behalf. On December 17, 1711, the families of the executed witches were given the sum of 578 pounds and 12 shillings to be distributed among 24 relatives of accused witches. The Reverend Samuel Parris tried to keep his job in Salem Village; but, the friends and relatives of Rebecca Nurse and Sarah Cloyce were eventually able to get rid of him. His wife, Elizabeth, died in 1696 and the following year, he left the village and was replaced by Joseph Green, who succeeded in smoothing over many of the divisions within the community and congregation. Parris then when to Stowe, once again arguing over terms of his employment. He lasted there only a year. He later remarried and died in 1720. Some of the “afflicted girls” — Betty Parris, Elizabeth Booth, Sarah Churchill, and Mercy Lewis all married. No one knows what became of Abigail Williams, Elizabeth Hubbard, Susanna Sheldon, or Mary Warren. Ann Putnam, Jr. never married. Both of her parents died in 1699, Thomas at 46, and Ann, Sr. at 37. Ann Putnam, Jr. was left to care for her nine younger brothers and sisters. At the age of 26, she wrote a formal apology that was read to the congregation by the new minister, Joseph Green. In her words, “I justly fear I have been instrumental, with others, though ignorantly and unwittingly, to bring upon myself and this land the guilt of innocent blood…As I was a chief instrument of accusing Goodwife Nurse and her two sisters, I desire to lie in the dust, and to be humbled for it.” Ann grew into a sickly woman and died at the age of 37, like her mother. By Krista Delle Femine, with additional edits by Kathy Weiser-Alexander, updated January 2019. Victims’ Memorial was dedicated in Danvers, Massachusetts. Aronson, Marc. 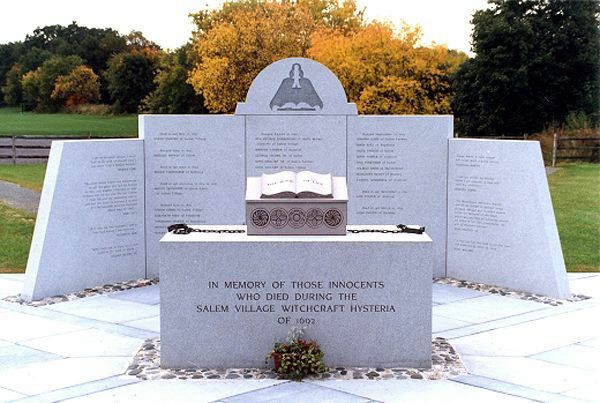 Witch-Hunt: Mysteries of the Salem Witch Trials. New York: Atheneum Books for Young Readers, 2003. Hanson, Chadwick. Witchcraft at Salem. New York: George Braziller, 1969. Hill, Francis. A Delusion of Satan. New York: Doubleday, 1995. History.org, US. “Puritan Life.” 2009`. Us History Online Textbook. 13 May 2009. Jack Tager, Richard D. Brown. Massachusetts: A Concise History. Amherst: University of Massachusetts Press, 1978. Kamensky, Jane. The Colonial Mosaic: American Women 1600-1760. New York: Oxford University Press, 1995. Knappman, Edward W. Great American Trials: From Salem Witchcraft to Rodney King. Detroit: Visable Ink, 1994. Sewall, Samuel. The Diary of Samuel Sewall. New York: Farrar, Straus, and Giroux, Inc., 1973. Starkey, Marion. The Devil in Massachusetts. New York: Alfred A. Knopf, 1949. Wilson, Lori Lee. How History is Invented: The Salem Witch Trials. Minneapolis: Lerner Publications Company, 1997. About the Author: Krista Delle Femine, from Hyannis, Massachusetts, attended school at Smith College in Northampton, Massachusetts, receiving her Associate’s Degree. She has five sons, a daughter, and triplet grandsons. She plans to continue her education and become a lawyer. About herself, she says she loves to learn and teach and that she hopes to pay her blessings forward by passing on what she has observed and learned. She also describes herself as a curious wanderer who intends to live her life with an open mind and noble heart in the hopes that her children will follow in her footsteps. This story contains additional information and edits by Legends Of America’s Founder/Editor Kathy Weiser-Alexander.